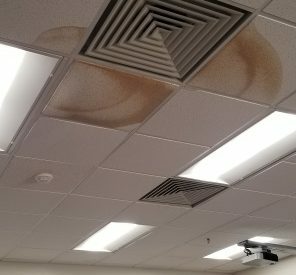 One part of the ceiling in the computer lab at East Middle School shows one area damaged by water that infiltrated the roof recently. The leaks are blamed on a 2016 hail storm. The Ponca City Board of Education approved a Declaration of Emergency and Resolution to authorize Superintendent Shelley Arrott to enter contracts for necessary repairs to severely damaged and leaking areas at Ponca City High School, East Middle School and West Middle School. The resolution also allows Arrott to bypass the bidding requirements of the Public Competitive Bidding Act only for the emergency repairs. Bret Smith, Executive Director of Operations & Risk Management, spoke to the board about the nature of the damages and the necessary emergency repairs. After new HVAC units were placed at East Middle School, leaks started occurring at the school. Inspectors found that the leaks were not caused by fasteners for the units, but instead the intrusion of water came from a hail storm in 2016. The roof at the school was manufactured by Duralast, and is a rubberized roof that causes the hail stones to bounce off, Smith said. However, no hard substratum was installed under the rubberized layer, and the hail stones sunk into the surface, causing a small fracture in the material before bouncing back. In 2018, the roof started leaking because of the small fractures in the Duralast layer, Smith said. Between the time of the hail storm and the time leaks developed, Smith said, the district had changed insurance carriers. The district hired a public insurance adjuster which determined the damage was caused by the 2016 hail storm. Smith said the adjuster determined there was $8 million to $10 million in damages to school buildings in the district, and $1 million was promised by the current insurance carrier for immediate repairs. However, Smith said that to date no payment has been forthcoming. Monday’s action of approving an emergency declaration opens the door to have a public adjuster to come to Ponca City next week to visit the schools with the district’s architect to determine which portions of the roofs at the high school and two middle schools are most in need of emergency repairs. The board’s attorney, Gary Bracken, said the emergency repairs constitute a very small portion of the roofs at the three schools, compared to the whole roofs. At Ponca City High School, he said, the emergency damage is located at the north end of the Howell Builidng where it intersects with the Math/Science area and an area most used for handicapped students. He said the water from a recent storm was pouring down the seams between the buildings and the roof acted as a colander. Bracken said the damage at East is on the south end of the school and is very small. Once the emergency repairs are made, other repairs to school building roofs will be evaluated and will be sent out to bid under the state competitive bidding law. Arrott told the board that once the contracts are secured for the emergency work, the board will need to convene again in a special meeting to ratify the contracts immediately. The local contractor who installed the Duralast roofs no longer installs that product, Smith said, and the district will have to contract repairs through a master level Duralast-approved contractor to protect the warranty. Board members unanimously approved the declaration of emergency and resolution allowing the repair contracts.